Posted on Tuesday, January 30, 2018 by "T". From January 18 to 28, 888poker has presented their XL Blizzard Series, regarded to be one of their best online series to date. What makes the XL Blizzard Series a very nice one to go to is because it is nicely split between three various buy-in levels in order to give everyone a chance to play in a splendidly structured tournament and to compete for a massive first place reward. On the very last day of the 888poker XL Blizzard Series, there were four tournaments scheduled as the final ones to conclude the 34-event series. The highlight on Day 11 and the most anticipated was the $1,000,000 Main Event, but of course there were big winners too in the events prior to that. Let's check out who won the Main Event as well as other events on the last day of the XL Blizzard Series. Event #31 gathered a player field of more than a thousand, with a buy-in of $215. This resulted to a prize pool of $200,000+ with $37,811 up for grabs as the top prize, which was won by TooMuckRake from Czech Republic. The much-awaited $1,000,000 Main Event had a late registration held open for five more hours. In the end, there were 730 players and 272 rebuys, which created a prize pool of $1,002,000, thus hitting the guarantee and a cash prize of $183,867 was waiting for the top winner! Many known poker players have participated, such as: Artem "veeea" Vezhenkov, Ben "jenbizzIe" Jones, Fabricio "DrMiKee" Gonzalez, Jans "Graftekkel" Arends, Jon "chut_up" Van Fleet, Steven "Kale333" van Zadelhoff, and Sofia "sofialovgren" Lovgren, but all of them busted quite early on the stage. Adrian "ADRI_ATM" Mateos, Anton "anteen" Bertilsson, Dominik "888Dominik" Nitsche, Niklas "tutten7"Astedt, Ole "olekonjole" Schemion, as well as 888poker Ambassadors Chris "888Moorman" Moorman and Martin "MJacobson888" Jacobson also participated, but failed to reach the part where money was rewarded. Also a sad day for 888poker Ambassador Parker "888tonkaaaa" Talbot, as he busted two spots away from the money right after he lost with ace-jack against pocket eights. Argentinian "Pepepepepe." managed to win amongst all that competition of over 1,000 strong, with the final hand as ace-king that won the coin flip against pocket fours. Thus, the first-place prize of $183,867 and the title of XL Blizzard Main Event winner goes to him (or her)! Canadian "jobrazeau" managed to beat everyone in this event and got $11,436, which is 381 times the buy-in he/she paid for. Second place goes to dnvz23 from Germany, who got $8,584. Not bad for just a very small buy-in fee on this tournament! And so concludes the 888poker XL Blizzard! Upcoming in May, 888poker brings back the XL Inferno and on September, there will be the XL Eclipse to look forward to. 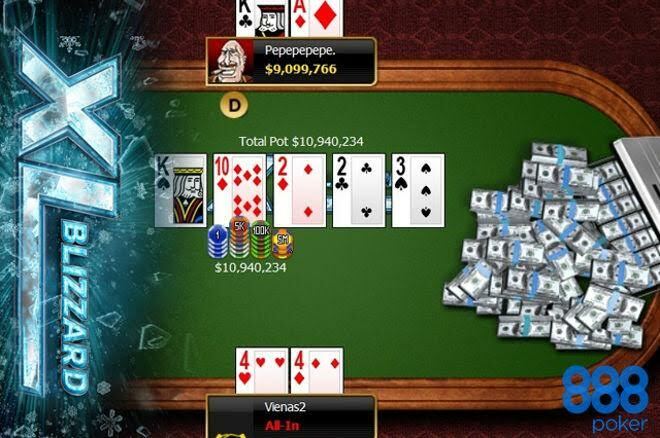 10 comments for "888poker XL Blizzard Main Event won by ‘Pepepepepe.'' for $183,867"
This days i was a bit nervous and i entered twice at 25/50 snap on different days and the first time i saw this player TooMuckRake. It seems he was very lucky and managed to win a nice sum of money. Congratulations to all the players who made in final tables in these tournaments. Al their tournament series there are XL? No wonder that the tourney with the lowest buy-in was the most popular to be honest. Yeah players think twice before paying two hundred or 1k for a chance to finish top10. Most high profile online tourneys are topheavy when it comes to the payout structure. It is a good thing when you could finish in that top3-top5, and it is a bad thing when you the first or second 2 bust out after reaching final table. pochui from my point of view you are right. Top 3 in big tournaments earns more money than the rest of the players. This is not normal and then you feel that something is wrong. Prizes should be changed for players to be more than satisfied. this think will bring extra players to the tables. Huge congratulations must go out to "Pepepepepe." on winning the US$1,050 buy-in XL Blizzard main event at 888poker and for scooping nearly US200,000. I look forward to watching the tournament highlights.